Is Heaven's Lost Property Forte planned for the near future? At least it saves you from the Trainwreck of the final movie. Yea but NO SAESON 2. Hmm, it's great they're being transparent and giving the heads up about the second season, but don't you think that tweet probably just killed a lot of their sales of the first season sets? This seems to happen a lot to MVM, sadly (not that it hasn't also happened with Manga and AL, but not to the same degree). It seems a like a self-fulfilling prophecy now - They can't release further seasons/parts because the first parts sell too poorly to justify it, and the first parts probably sell poorly because people expect them not to release the second parts. I can't blame MVM for not releasing things that aren't going to make them any money (they are a business at the end of the day) but I wish it weren't so. I'd like to support more UK releases, but it's annoying to have to start importing part way through a series and then end up with a non-matching set. 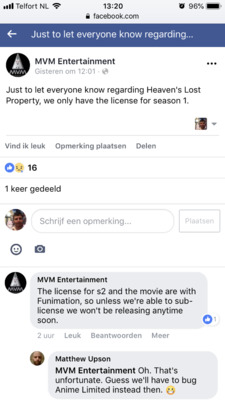 I do wonder if Heavens Lost Property was thrown in with another licence. As others have stated it's been out in America for quite some time. It doesn't happen that often these days but I can see why folks are frustrated. They didn't completely shut down the sequel at least. But I agree it's rather annoying to only get part of a series. Should be like Amagami, get both seasons and release them back to back. Gotta say I've owned the US set since it came out but purchased the deal of the week because i'd like to support them and hopefully they'll see people want season 2. Better yet, put season 2 out with a chipboard artbox with room for 1,2 and movie and youd probably get a lot of double dippers. Just release shows with only 1 season, like I dunno.. Shirobako! 😉 Then this wouldnt be a problem. How long until that gets an english release though? A year? 2 years? Its a bit different to licensing only season 1 of a show that ended years ago.